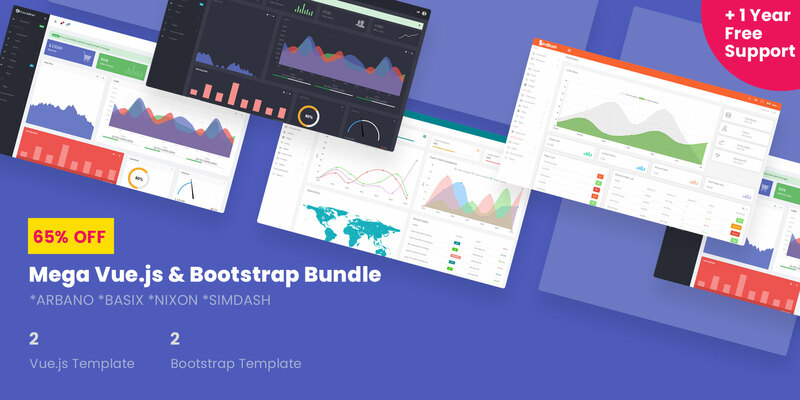 It extends the latest Bootstrap v-4.0 components built by Vuejs, offers everything you need to get started for your CMS, Custom Projects, CRM and Admin Dashboard Projects. 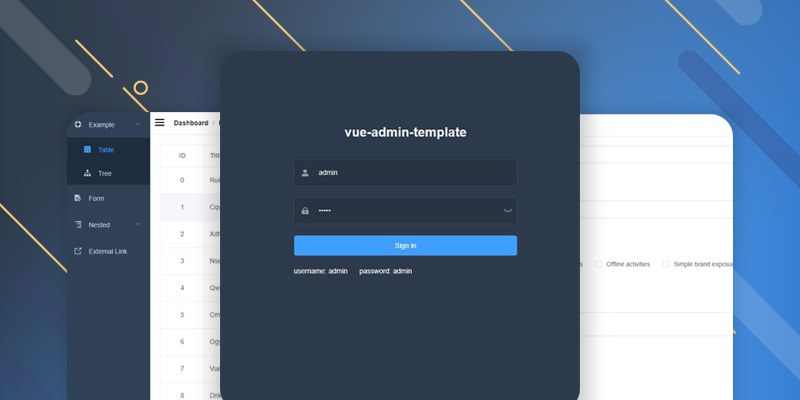 Vue 2 is a growing framework and most competitor with Facebook’s Reactjs. Enterprise Applications and Small Applications allows for a modular Component Setup. Components can be added or removed by simply corresponding files/folders, we’ve Developed this Template component-specific and modular based. 60+ widgets variations give you more flexibility to create any kind of Designs as per your needs. It’s very easy to customize. Menu Items can be added/removed from nav.js file. Just a Single file Creates your Menu, it’s super easy to customize such as Dropdown, Divider, Badges etc. We’ve made the Navigation as a component, you don’t need to touch any other files. Everything you need on nav.js file. Every single Block Element has own components, so it’s 100% component based and modular Template. If you need any new Component/Page then just call the router.js and linked to Navigation, that’s it !!! Vue-CLI and Webpack will give you more flexibility to ensure the Code Optimizations, error-free code, minify files and so on. Blazing fast and light weight! 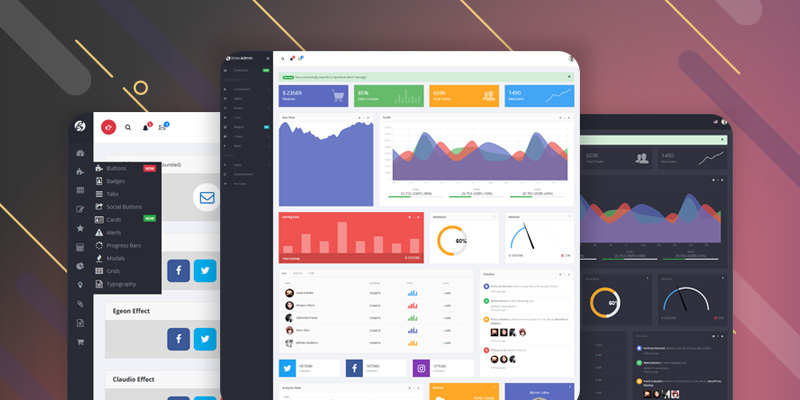 Completely customizable 60+ Widgets to use in your dashboard! All other assets shown in the demo are included in the download. All external libraries are loaded with npm. All it takes to get up and running with our template is NodeJS, which is quickly installed and well documented. NodeJS automates the whole process of loading external libraries and allows for an easy headstart. Create a Project directory on your home directory. Copy all files from Basix-Admin folder on your project folder. Go to your directory with “cd" command. After finishing install you will see a folder named “node_modules" created. After that, you need to run “npm install" command. All Dependencies will install from “package.json" file, it will take a couple of minutes to finish. 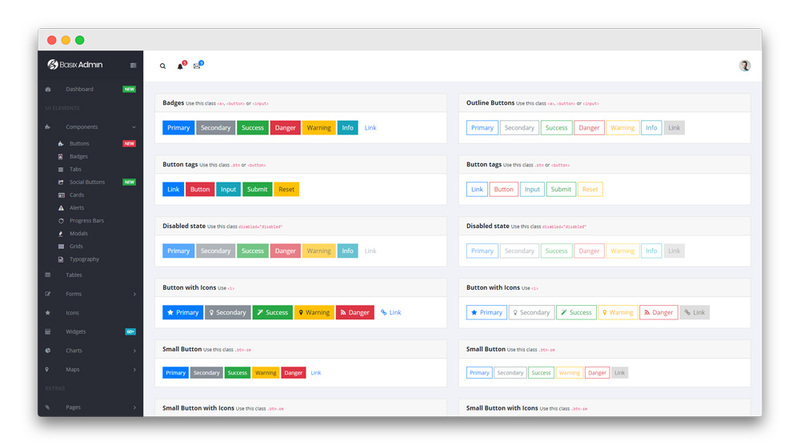 Components: We have added tons of random components for different type of Dashboard layouts. Each components has multiple variation. We know that you need multiple style on different page for same component. 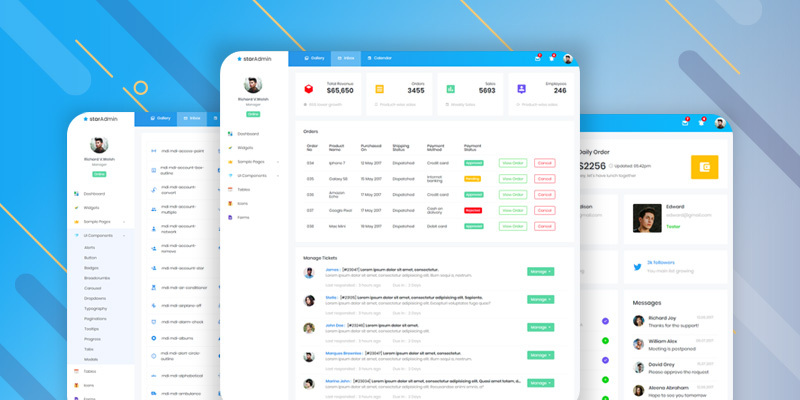 Here you will get Buttons, Badges, Tabs, Social Buttons, Cards, Alerts, Progress Bars, Modals, Grids, Typography within this section. Tables: 3 type of Tables are available in the Pro Basix Version. First one is basic Table. Second variation contain Colors, Icons, Labels within the table. And the Third is the best one for different complex project. It has Search & Pagination system. Also you can select how many row you want to visible the page. Check out the following GIF file for better understand. 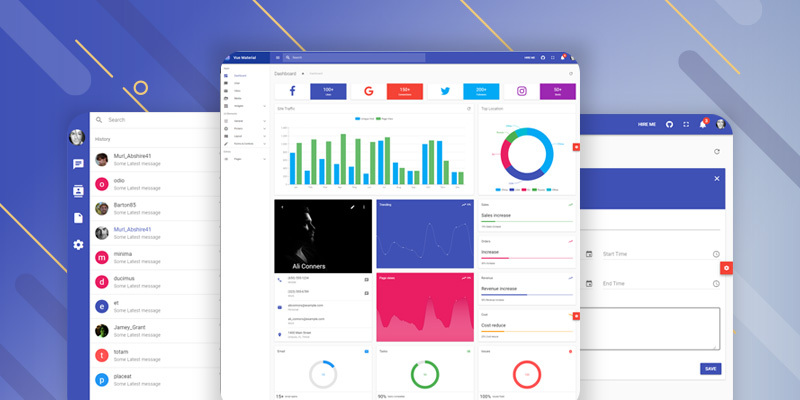 Forms : We can’t think a Dashboard App without Form. Form help us to grab and arrange Data easily. 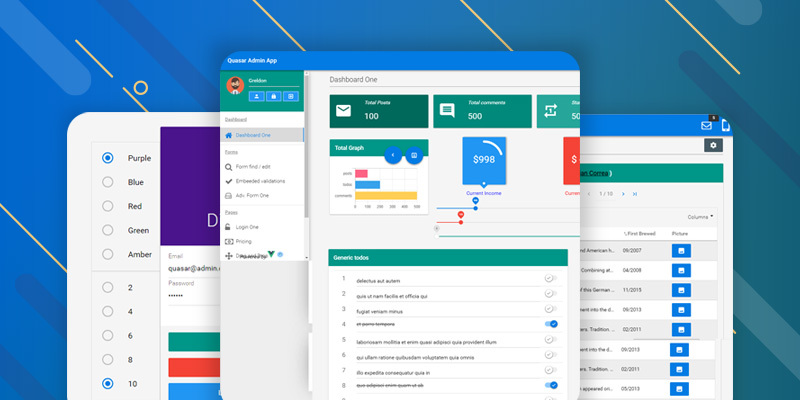 We have thought and researched a lot on Forms, so that we able to provide everything what a Developer need to design simple or advance project. There are three type of forms. 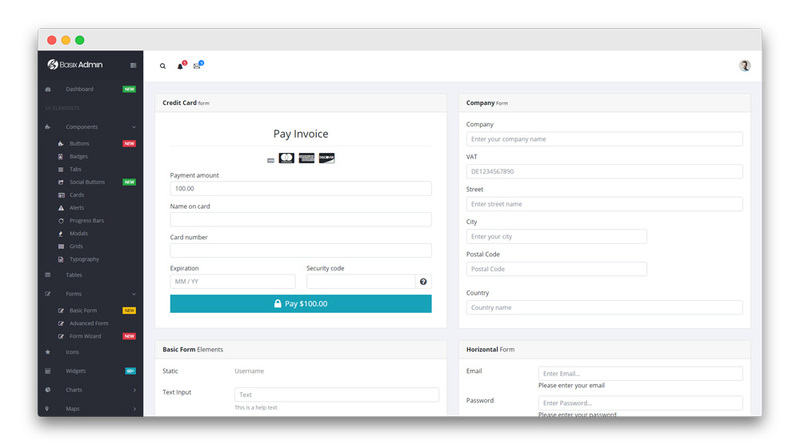 Basic contains all general stuff like Payment, Name, Mail etc. In the advance section you will get Date Input, Phone, Country and some other option. And the third is magic. It’s the wizard Form. Take a direct look of our Wizard Form from Demo. Widgets: There is nothing to explain about Widget because you know everything about it’s usage. Let me mention some stuff like Sales counter, Social counter, Profile Card etc are available here. No complain on Design quality and each components variation. Best template for my project.